Clive Walley is an artist whose work has spanned painting, animation, filmmaking, environmental shows, and installations. His highly acclaimed work in animation explores the potential of paint within the moving image through many original, beautiful and dynamic works. These pioneering films have a depth of feeling for landscape, and an insatiable curiosity for the potential of material and equipment that gives them a great energy and passion. Clive was born in Cheshire in 1943. After completing a degree in engineering at Manchester University he went on to do a teaching diploma in Bangor, Wales where he took art as an extra option. Whilst his teaching career was destined to last only a year (it was in Walley’s words “a distaster!”), he had started having exhibitions of his work and turning his attention more fully to art. 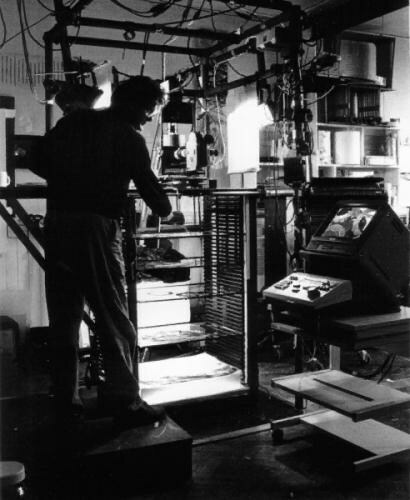 In the early 1970s he made a film entitled ‘This is the Life?’ which explored animation techniques and introduced the element of paint which remained at the centre of his subsequent animation work over the next few decades. Clive now lives in Frome in Somerset, and these days he fully devotes his artistic energies to painting. I was thrilled when he agreed to answer some questions via email about his films, his working process and the context of his work. EoF: Your films bring the physical medium of paint alive through animation and you have spoken of your desire that “…the meanings which emanate from process in painting might inform film”. Was it important to preserve an element of spontaneity and improvisation within your filmmaking process? To what extent were the films planned out or did they develop of their own accord? CW: The idea was to “paint movies”. The manner they were to be painted in was the difficult issue. 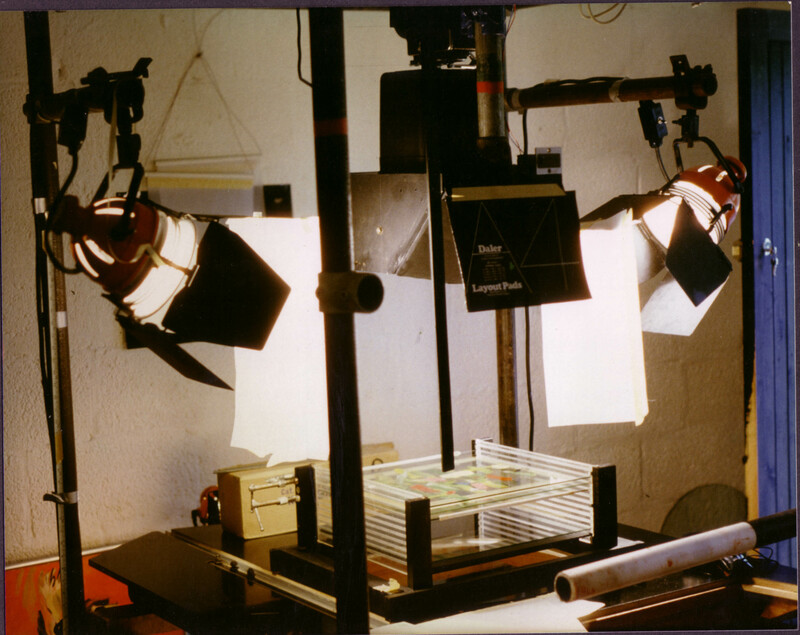 Industrial animation at the time involved a certain amount of routine “painting” and in the rest of the film world claiming kinship with Painting was a popular way of announcing the art claims of your work. But I meant “my way” of painting which by then had become improvisational – a common enough technique but still somewhat in opposition to the traditional way of building a work to a predetermined end. The Abstract Expressionists took the method to the end of the road and I was still in thrall to that work even though the critical world had long ago killed it off and hung it out to dry – early 80s. I was determined (all by myself!) to save painting from it’s eclipse by TV, cinema and commercial graphics so I felt OK about rehashing the work which preceded the Pop Art, Media and Conceptual takeover. It had to incorporate the gesture, even the hand (in the white glove in the ‘Quartet’), and it had to show wet paint still active and open to change on the screen if it was to do this. The problem was obvious, obviously. Stop frame animation, is very stop and go, and yet was the only way to make clear what I meant the paint to do. You can throw it around, (very popular nowadays in slo-mo). You can run it down slopes, (like Morris Louis did, and I did in the second Adagio piece), but you can’t really make it seem intentional, like paint is under the hand of a painter. For that I had to cut the darling “process” up into little bits and get over it. That said I did everything in my power to maintain an improvisatory relationship to the movements of the paint and to the larger structural elements like the music and the “narrative”. I could start a film in the middle and see where to go with it after seeing something I’d made with no clear plan about what it was going to be part of. In my work, maybe the exemplar of this thinking is ‘Brush Work’. That film is a continuous, unplanned, potentially infinite, improvisation made up on a daily basis, and done in one shot. I made it without the editorial from BBC2 because I didn’t want to argue about it. Channel 4 had already turned it down. I had made the rig in order to do that film and didn’t want to waste an opportunity to see how it would go. Oskar Fischinger had made one (maybe two?) in the 40s(?) but his “filled up” as he went along. 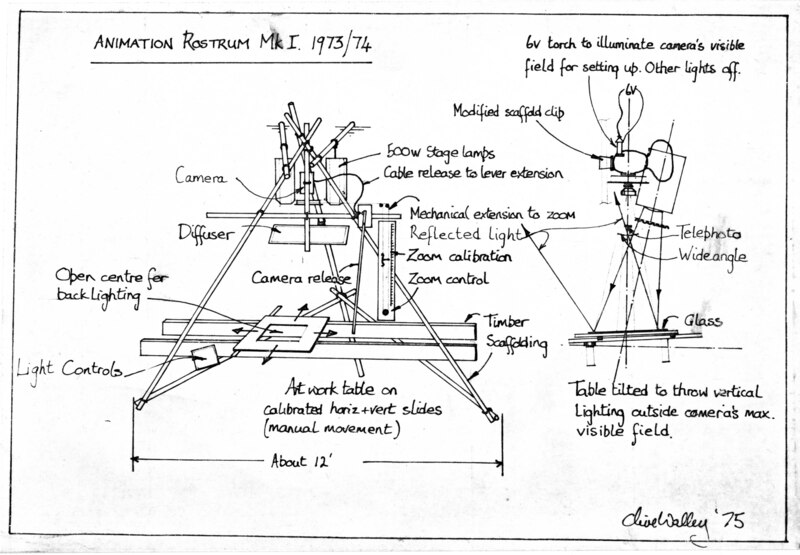 On the final rig, which I made the ‘Divertimenti’ on, I could do the pantograph controlled camera moves by quickly drawing curves on the pantograph table and graduating them by eye very quickly – so that was a bit like flying the camera – the point of view became a gesture among those being made by the paint. Like that I began to come to terms with the fact that I was using photography to make new kinds of painting. I resisted all the artefacts of photography to start with because I was so solidly making paintings – their distinguishing feature being that they moved to make some of their meanings. I wasn’t really interested in the contingent fact that to move they had to be movies! I relented over the years and began to accept that I was painting movies and that was maybe a medium itself. I built the final rig to incorporate, in as spontaneous a way as I could, all the photo artefacts, camera moves, back projections, depth of field effects and lighting board, but each thing I let into my world had to fight to get in – because each one had had no previous relation to painting and I did not want to recognise it. I only wanted the paint to move, I didn’t want the other stuff – but I did it all in the end! EoF: In your animating process were you able to get into the same kind of mental ‘zone’ as when you painted and work in a way comparable to the process of painting? CW: This is somewhat covered in the above stuff. I likened it eventually to playing the piano – you had to learn a lot of arbitrary technique in order to play loosely and easily. I spent days at a time in the zone because I was handling so many variables live and physically. The last rig became a kind of easel to me in the end on which I could, kind of, paint movies. EoF: Did this approach remain important as you continued to develop your work in film? CW: I got more interested in just what painting could use as subject matter once you could “play the piano”. ‘Light of Uncertainty’ was a big piece for me and was only supposed to be the first film in a trilogy. Its relationship to quantum physics is very complex (though not as complex as actual quantum physics!) and I have made an attempt to explain that in the article in Film Waves. I think it showed the way I would have gone with that work if I had continued to enjoy the privilege of being paid. With Painting able to operate in more dimensions, it seemed to me, it might find a way of using some of the difficult questions of our time as motifs – most of which involve the dynamics of relationship of one sort or another and the nature of the self-in–the-world. A fixed surface, at first sight, does not even have the dimensionality to tackle moving (time-based) matters like those and anyway painting has suffered the eclipse I feared and no longer holds the floor. It has lost the authority to offer complex meanings to contemporary arts audiences because, unlike contemporary literature, people no longer expect to find them there. I think there remains an audience, perhaps like that for art music (modernist or traditional) which is diminishing and discriminating at the same time. That’s the audience for me now. EoF: Your films convey a real sense of fascination and curiosity with the physical world around us, and in scientific concepts such as quantum physics which seek to comprehend how things work. Can you describe what excited you about the medium of animated film as a means of exploring your interest in these ideas? CW: I should read ahead shouldn’t I. Perhaps you have read somewhere that I was trained as an engineer first. According to some of my peers that does show sometimes. Perhaps I am a bit of a constructivist, maybe I imagine systems of connection and causes and effects where there is nothing really. I thought animation might become the new queen of the visual arts. But it has become a big business instead. It could have been an access point for the single artist to the big media if the right structures had been put in place. When I was making those films I wanted to find a form for painting which would re-equip it to help lead the visual arts into the future. I liked its long roots into the past and I liked its technical frankness. I didn’t like the marvelling astonishment sometimes occasioned by my work “how the hell did you do that” – no-one thinks to ask a painter how they made a painting, everyone knows. I like that about painting. I suppose I wanted painting like that to be on TV because the non-art audiences were there, and they might respond to the films as a “modernised” sort of painting – something they inherently understood. Those audiences might have connected with the solo artist, but through the ubiquitous TV rather than the gallery, which they would (in those days) never go to. I was wrong about all that of course, but similar spirits could be found in Channel 4 at the time. Those non-art audiences turned out to be easy meat for ‘Ice Age’ and ‘The Incredibles’ – marvellous corporate products – and not specially interested in the lost kingdom of painting. Now painting has lost its high status I am interested in addressing the rump audience you can still find in places like the one I live in – because they still feel for the relationship between artist, meanings and seriousness which I lived with most of my working life, and which has given way to something else which I don’t quite get – or the part I do get I find capitulatory and unambitious. EoF: I am interested in the effect of the cultural climate around you while you were making films. Your filmmaking coincided with a more supportive period for making experimental animation for TV broadcast. If this hadn’t been the case do you think you would still have gone into making films in the way you did? What do you think you would have done otherwise, in a less supportive time? Did you feel part of an experimental animation community through festivals and other forums for showing work? Who were your peers that you were most inspired and impressed by? CW: You are right! I was entirely a product of the Channel 4 support. In Wales we also had S4C which started at the same time. By putting projects to both halves at the same time I was able to get enough to make the first few films I did, even though they were strange offerings. Then BBC2 moved into art animation, though it was mostly Aardman for them, and I used money from them as well. The festivals helped us a lot then. By giving awards to films the commissioning editors were not completely confident about their morale was strengthened when they had to argue for money from the channel controllers. I would never have made the films without the money. I worked doggedly on them for years and years and could not have afforded the time, let alone bought the equipment, it took to make them. I think those arguments I was trying to speak about above about art and the wider audience, the position of painting in the pantheon of the visual arts, the relationship between “dominant” cinema and art cinema, commercialism and creativity etc, were much more current then than I believe them to be now. I knew and admired Paul Bush and Phil Mulloy. I came to know Piotr Dumala the polish film-maker quite well. I was often compared with Oskar Fischinger, Len Lye and others who had put painting at the heart of their practice. At festivals I always felt over-awed by the spectacular talent showing on the same screen as me and could not get used to the awards I got when so much else seemed far better. But then the international art film community was very supportive, perhaps they wanted to support people coming into it from outside like I did. I recognise that mine were different, (like tissues against the weaponry of others) and now I can see that indeed they wore their “campaigning for painting” message on their sleeves – maybe people liked that. I do miss the festivals but I would not know anyone there now. EoF: Looking back, how do you view the animated films you made, within the context of your own work and in their own right? What do you see as your strongest work(s)? CW: I think my strongest film work was maybe a couple of the Divertimenti (Brush Work and Life Study) and Light of Uncertainty, though other people have preferred others. I got an award for the first of the Quartet (Prelude) and I still play that occasionally but I have moved on in many ways. My last video works were installations and were “about” the painting of Michael Bennett – a painter I found here when I moved to Frome in 2004. I love those pieces to this day but they need gallery space to see them at the correct scale and they never get out now. At the moment I am painting pictures as if painting had never died the great death I pronounced upon it. I am in love with it all over again and have the wonderful town of Frome to thank for the meaningfulness of my present obscurity. Thanks for the opportunity to sail through those waters once more.